With technological advances coming nearly every day, drones are being put to new and innovative uses around the world. This article highlights some of the interesting ways Unmanned Aerial Vehicles (UAVs) are being put to work and play. 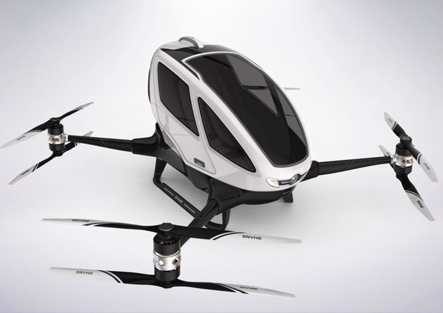 The city of Dubai in the United Arab Emirates has announced that a UAV taxi service will begin operating this summer. The Chinese built eHang 184 aircraft are capable of flying one person for about 30 minutes at speeds better than 60mph.The drones were demonstrated at the Consumer Electronics Show (CES 2017) this past February in Las Vegas and have had more than 100 successful manned test flights. Would-be passengers enter a location of choice inside the fully-autonomous vehicle, pay for the ride, then enjoy a traffic-free commute to their destination. Everyone imagined that we’d be able to upgrade our Amazon shipping to “Same Hour” years ago; unfortunately, government regulations are holding back the airborne delivery of household necessities such as the Hutzler 571 Banana Slicer. The first actual deliveries by Amazon occurred in Cambridge, England only this past December. The city is supporting the effort by allowing an incremental increase in UAS activity as Civil Aviation Authorities examine such key factors as flying beyond line of sight, avoiding obstacles and monitoring a fleet of drones. Target delivery times are within 30 minutes of an order being placed; one of the first deliveries was received, from click to drop off, in only 13 minutes. Tequila manufacturers and agave farmers are under the constant scrutiny of the Tequila Regulatory Council (CRT); this is especially true when products claim to be produced from 100% blue agave. The non-profit employs a fleet of UAVs in an effort to map around 340 million plants and conduct spot-checks on farmers. This operation is vital to the tequila industry because the genetically-similar plants are particularly susceptible to disease. Additionally, the CRT uses these surveys to calculate the maximum amount of blue agave a farm could produce. If the farm produces over that maximum amount, CRT authorities will know lesser species of agave were likely smuggled into the harvest. Under grants from the World Wildlife Federation and Google, contractors are providing drones to park rangers in Africa that use thermal imaging cameras to find poachers in the vast lands under their control. The program is still in its infancy and officials are not yet sure how best to leverage the drones capabilities or integrate them with ground forces, but the potential for making a significant impact on the poaching problem is very real. The Drone Racing League (DRL) is on the cusp of international success. As they prepare for Season 2 in early June, several key components have fallen into place; most notably, broadcasting contracts with ESPN, Sky Sports (UK) and Prosieben Maxx (Germany). The league is also generating a lot of buzz with favorable articles being published in Time, USA Today, Bloomberg, Vice, NPR and Wired. The heroes of this new sport do not resemble your stereotypical sponsor-clad race car driver in any way. In a scene reminiscent of a sci-fi movie, pilots dawn First Person View (FPV) goggles, allowing them to virtually sit in the cockpit of the bird-sized racers. Coincidentally, this gives the audience incredible views of the action as the drones zip through indoor and outdoor courses at speeds that can reach 80mph.